There is a more user friendly way to benefit from iron supplementation. 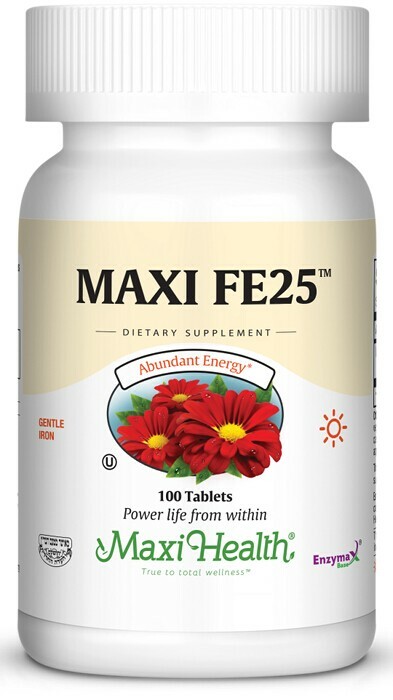 It’s FE 25™ from Maxi Health. Menstruating and pregnant women, athletes, and vegetarians may all have difficulty getting adequate iron supplies from their food. That's because iron can cause constipation. We at Maxi Health Research use the ferrous fumarate form of iron which is the least constipating. Try FE 25™ - the gentle iron supplement. Dicalcium phosphate, microcrystalline cellulose, vegetable stearine, modified cellulose gum, Enzymax® (calcium carbonate, bromelain, papain, lipase, amylase, protease, silica), aqueous coating. This product contains no animal products, soy, wheat, gluten, salt, sugar, milk, yeast, artificial flavors, colorings or preservatives.